We've seen our share of unusual condom usage over time, so the DIY condom "decor" should come as no surprise. 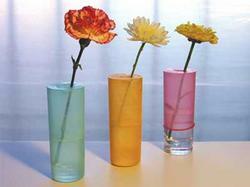 Bored and perhaps a bit "frustrated", someone created an instructables-esque way to make a colorful flower vase. By rolling colored condoms over an appropriately-sized vase and cutting off the tip, you're left with a beautiful place to put flowers and weird out house guests all in one. Let's hope that the spermicide smell doesn't over-power the petunias.